Of course, there is nothing like just reading the Bible itself. God’s Word is powerful beyond our best attempts to interpret, explain, or apply it. There are many excellent translations to choose from. And there are also many helpful ways to organize your reading. But I also find devotionals helpful to motivate my reading, thinking, and living according to the foundation of God’s mighty Word. Below are a few of my favorites, both recent and classic. You may be surprised that there are not more specifically "mom" books. One thing that's crucial to keeping our sanity as moms is to continue to nurture and grow our whole selves—our soul. These are just a few of the books that have helped me do that. My current favorite devotional. A scripture-saturated, grace-filled book which does not hesitate to confront and convict as well as encourage. Each devotional is one-page, but begins with a tweet-sized quote which will resonate through your day even if you don’t, on some days, get to the rest. Good follow-up suggested Scripture reading each day as well. All scripture, arranged by topics for morning and evening. I really like how this brings to mind scripture I may have missed or not pondered in a long time. But it’s good to remember that selected verses may read differently out of context, so I often look up verses in context. Scriptures are listed below each reading. A devotional based on the classical method of lectio divina. Each day features a one-page passage from scripture (The Message paraphrase), followed by “Read/Think/Pray/Live” sections to aid in reflection and application. Helpful in focusing deeply on a particular passage, but do remember that The Message is a paraphrase, not a direct translation. Sometimes you may want to compare the passage in a straight translation. Author Sarah Young spent many years (many of them very hard years) reading scripture, praying for the Holy Spirit's teaching and comfort, and paraphrasing God’s words to us in her own words. This little book is the fruit of those years. Each day is written as if Jesus is speaking to you personally. This approach allows for great latitude in the author’s interpretation, so I especially like to follow up with reading the actual verses that are listed below each entry. An effective way to minister to the heart of even seasoned Christ-followers, it also is a good place for many seekers and new believers to start. A twentieth century classic that I read year after year. Even the years I plan to skip, I always find myself dipping back into it from time to time. Daily devotionals are based on talks given by Chambers between 1911-1917 in the training of young believers and missionaries in both England and Egypt. After his too-early death, his wife compiled much of his teaching into this wonderful little book. This is a “contemporized” version, which many prefer, though I still read the original because I have the copy that both my mother and my Nana read long ago. God’s truth penetrating three generations—and so many more. Another “classic” published in the same era (1920’s) as My Utmost for His Highest. L.B. Cowman was a missionary in Asia along with her husband, Charles. This devotional is a compilation of Cowman’s favorite writings from many well-known Christians in previous centuries—F. B. Meyer, Andrew Murray, A. B. Simpson, Hannah Whitall Smith, and especially Charles Spurgeon. Very little, if any, specific bibliographic data is included, making it difficult to trace back to original sources, and this is not a book for theological study. But the devotionals have ministered to countless Christians over the years—including me! Like the previous entry, “modernized” versions are available. One of my all-time favorites. Though written as forty Lenten devotionals, I recommend it for any time at all (and as many times) as you can read it. Wangerin draws us into the passion story as recorded by Mark in such powerful ways that I will never hear the World’s Greatest Story in the same way again. Even if you don’t get through the whole book every Lent, buy it for the Introduction. It alone is worth the price of the book! 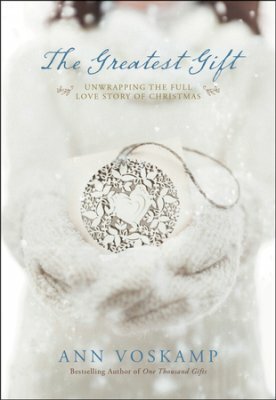 A great book to read for Advent. Though not quite as powerful as Wangerin’s Reliving the Passion , I still like to read it every Advent. I love this book. Actually, I love most everything by Voskamp. But I think this one is my favorite. Another “Christmas book” which should really be read all year—and repeatedly. I keep going back to my favorite quotes. Honestly, there are too many to include just one. Read and mark yours! One of three great little (but deep!) devotionals that follow the Revised Common Lectionary, with suggested daily Scripture readings followed by reading for reflection from a wide variety of spiritual writers. Intended to help incorporate the daily office into your daily life, it can be read in a number of ways. Also includes an excellent introduction to the Liturgical Calendar, especially helpful if your Christian tradition doesn’t follow it specifically. An all-time favorite. I should re-read it once a year. I love this book—I re-read it as soon as I finished it the first time! By Timothy Keller / Penguin Putnam Inc.
A fresh look at a familiar parable. Read anything by Keller. A fresh look at the language of Jesus in parables and prayers which will revitalize your language. Read anything by Peterson. I really enjoy Ortberg's writing. This one is a very well-balanced book on spiritual disciplines. Practical advice on how to experience the presence of God in the day-to-day routines of life. Another wonderful book by John Ortberg; in fact, I recommend anything he writes, really. With elegant, profound simplicity, the author illuminates what life truly lived with God can look like. This book of “poems of a pilgrim,” drawn from various scripture passages (which are included in the back), deeply nurtures my soul, especially during dark days. And a few favorite authors . . . I especially love Disappointment with God and What’s So Amazing about Grace? OK, I said just a few; but it’s hard to stop listing favorites by this author! Many books, but I have listed two favorites under "Recommended Books for Discussion with Leaders"